Singasari Temple Malang is one of historical site located in Lawang of Malang City exactly at Candi Renggo village, Singosari Subdistrict for about 9 km from Malang city. If You are enjoy Malang City tour, very suitable drop off to Singasari Temple because the distance with other tourism not too far. Singasari temple also called Cungkup temple or Tower temple which meant the highest with other temples in the compound. Singasari Malang is the one temples have gone without a trace. There is no certain time when this temple was built. According archaeologists estimatation its built around 13th century since The King Kertanagara of Singosari Kingdom. There are two shrines dedicated to Kertanagara, Singosari temple and Jawi temple that indicated in the presence of several Shiva statues in the temple’s court. Singosari temple Malang located in the middle of court. The Singasari temple body rests on a shelf, 1.5 meter high. The base of the temple is simple in design, without any ornament or relief. Unlike other temples, the stairs at the base of the temple bear no decoration of makara pattern. The entrance into the space inside the temple is located at the front side of display room (a small frontward projecting room), facing south. The entrance is also simple without ornaments engraved on the sills. Above the entrance sills is a relief sculpture of a kala head. The artwork is very modest. Some relief sculptures are so modest and simple that leads people to suspect that Singasari Temple was partially completed. Similar niches are also found on the other three sides of the temple’s body. These niches are bigger, with an indented display, above which sills simple ornaments of kala head are engraved. At the center of the room there is a yoni that is already damaged in its upper part. No engravings are found on the yoni’s base. At a glance, Singasari Malang Temple seems to be arranged in two tiers because the roof’s lower part is in square shape, resembling a small chamber with niche on each side. It appears that there were statues inside the niches, although four of them are currently empty. Above the sills of each niche’s “door”, there are engravings of Kala head ornaments which are more complicated than those above the sills of the entrance and niches in the temple’s body. The roof top is pyramidal in shape, with gradually narrowing structure towards the top. Portions of the roof appear to have collapsed. Singasari temple around Malang was partially restored in the 1930's by Dutch government, as stated in the relief at the temple’s base. 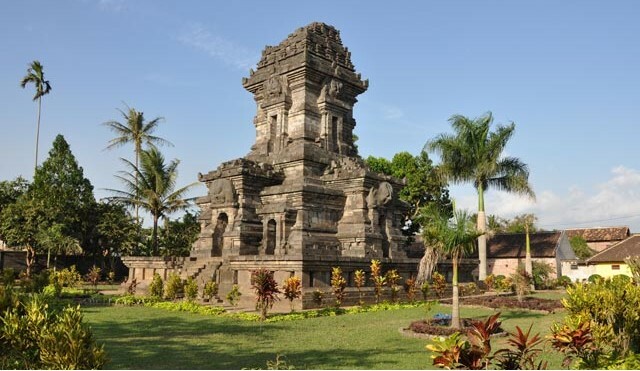 However, the restoration of restoration Singasari Temple Malang was not completed since there are still many rows of stone piles in the yard not successfully restored to their original positions. It is difficult to put the stone in the right place. The Singasari temple yard also has some statues, most of which are in damaged or unfinished condition, such as Shiva statues in various positions and sizes, Durga, and Lembu Nandini. The history of Singasari Kingdom has given birth to a legend of Kris (Javanese double-edged dagger) Mpu Gandring that is highly popular among the people of East Java. Legend has it that Ken Arok was born out of an affair between a woman from Panawijen village named Ken Endog and Brahma. Shortly after his birth, his baby was abandoned by his mother in a cemetery, and then was found and brought home by an experienced thief. From his stepfather, He learned many things, such as murder, gambling and robbery. Young Arok became the meanest bandit around Tumapel and people were afraid of him. One day He met a Brahmin priest called Dang Hyang Lohgawe and the priest advised him to leave his walk of life. Following the advice of the priest, He quit being a criminal and became a Tumapel soldier. The then chief of Tumapel of Singasari Temple, an area within Kediri Kingdom, was Tunggul Ametung, who married Ken Dedes, the daughter of Mpu Purwa who lived in Panawijen village. A son named Anusapati was born out of the marriage. One day, She went home to see her father. As she stepped down from her imperial carriage, a strong wind blew open her under skirt. Arok, who was on duty of escorting the carriage, briefly saw the thighs of Tunggul Ametung’s wife. To the eyes of Ken Arok, the thighs produced a sparkling light. The scene lingered on the mind of Her. He then asked Mpu Parwa about what he had seen. The master explained that the light was an omen that Ken Dedes was predestined to be a woman who would descend kings on the island of Java. Ken Arok then ordered a Kris from a Kris master (mpu) in Tumapel named Mpu Gandring. It takes long to forge, shape, and follow the necessary rituals to make a reliably powerful Kris. Because the completion of his Kris was dragging on, She became very angry. She snatched the unfinished Kris and stabbed it to the body of its maker. Dying, Mpu Gandring cast a curse upon Ken Arok that he too would meet the same fate to be killed by the same Kris and that the Kris would take seven lives. Ken Arok lent Mpu Gandring Kris to his colleague, Kebo Ijo, who liked to show off. Kebo Ijo showed the Kris to his fellow soldiers and bragged that the Kris was his. After it became a common knowledge that the Kris was Kebo Ijo’s Arok stole and used it to stab Tunggul Ametung. As it was expected, people, who were under the impression that the Kris belonged to Kebo Ijo, accused him for the murder while Arok walked freely and took over Tunggul Ametung’s place as the chief and married Ken Dedes. Singasari Temple in Malang is a part of Malang heritage. If You are interested enjoy other tourism in East Java Island. You can read the tour package option mbelow.